Tweet On a daily basis I get a lot of interview and album review requests. I don't have the time to do them all. I like to start with an interview and see if that makes me want to listen to the album. Most of the time it doesn't, but that is not the case with the band I just interviewed, The Crash Street Kids. These guys are bringing 70's era glam rock back and they have the music and live show to prove it. I am definitely looking forward to listening to their new album "Sweet Creatures." Zoiks! (Z! ): How would you describe your new album "Sweet Creatures?" A.D. Adams (A.D.): "SWEET CREATURES" is a concept album about two runaways living on the streets, doing whatever they have to, in order to survive. The term "concept album" can be a bit off-putting, since a lot of concept albums require certain songs to played in context, or sit within the story line. "SWEET CREATURES" differs vastly in that sense because each song on the album stands on its own merit, as a SONG, without requiring the listener to be aware of its meaning to the story line. 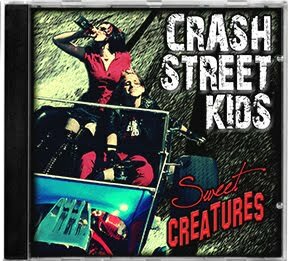 The songs on "SWEET CREATURES" encapsulate everything that CRASH STREET KIDS are into. There were so many great forms of "glam rock" back in the early-to-mid 1970's that are an important part of the overall CSK sound. There are songs on this record that take on a bit of a punk edge (Title track- "Sweet Creatures"). There are some that recall a glitter vibe ("Mary, Queen of the Rock"). Some have a bone-thumping, four-on-the-floor, dance groove ("Bang, Bang! You're Beautiful"). Some of the songs have a darker, more sinister feel to them ("Harlot of the Flies" and "I Become Death"). There are love songs ("3rd Avenue Vampires" and "Sad Julia"). There is even a traditional "stomp" groove ("Angel"). And some just reek of straight-ahead rock and roll, Daddy-O ("Asylum")!!! The thing is, that all the songs, collectively, sound like a CRASH STREET KIDS album! There is no doubt amongst all of us in the band that this is our best record yet....by far!! This album is something that we're all really, really proud of. Z! : This is your fourth album? Is that right? How is it different from your previous efforts? A.D.: Well, technically speaking, it's our fifth album!!! Our fourth record was the double live release called "LIVE! FROM THE WAIST DOWN". That one was recorded at Alice Cooper's club, here in Phoenix, over a two night period, and is only available as a download. So this would be our fourth STUDIO album. I think what makes "SWEET CREATURES" a bit different from our previous releases is the way in which it was recorded. We took a different approach in the recording process. First of all, we took more time on this one. Our first three albums were banged out over a three year period- one every year. Then, for the "LIVE...!" album, we spent some time mixing that, while starting to compile the songs for "CREATURES". There was no pressure at all, so we took a much-needed break, and simply took our time. We approached the recording in a more traditional way, as well, with each player really getting to rehearse and refine our individual parts. Much more so than the first three studio efforts. We were able to articulate our ideas more succinctly this time around. I think it was worth it. When I listen back to this album, there is a more definitive CRASH STREET KIDS texture on each and every song. Z! : What is your bands writing process? A.D.: There isn't really ONE particular way we go about the process of bringing a new song in. I suppose that's what makes us so unpredictable, musically. Sometimes it starts with a title. Sometimes a vocal line or phrase takes shape. Sometimes a guitar riff, or a drum groove, can suggest a new idea. We also make sure that we don't write exclusively towards a story line, since were quite aware of the fact we were, indeed, making a concept album. That can be a very fine line- becoming a slave to the story, instead of making a good song first, THEN fitting it into the story line! More often than not, though, Ryan would come in a couple of days after a rehearsal or session, and have something written, maybe just a few rough sketches of a song. But other times he'd come in with a complete song. We all write and contribute, but Ryan is the main songwriter. He is, without a doubt, the most un-selfish writer I have ever worked with. He welcomes and encourages us to create our individual parts. We even suggest parts for the OTHER guys in the band, on occasion. This is truly a "band". A real team, in the true sense of the word. We all help with the arrangements, back vocals, and instrumentation. The overdub sessions are a blast, because we'll just sit around drinking a bottle, or two, of Jameson with tape rolling. Hand claps, gang vocals, cow bells, and various other noises usually generate from these sessions!!! (laughs) But the common thread throughout all of the songs on all of our records is that we ALL end up shaping the song into its finished state. A.D.: Oh, Man!!! Where do ya start, when trying to describe a CSK show??!!! It's loud. It's bright. It is as bombastic a show as you will EVER see, much in the vein of a Kiss or Alice Cooper show! We bring the whole circus with us!! We incorporate the Barnum and Bailey approach: leave 'em gasping!! We have ramps, steps, platforms, and risers....even an elevating piano on our custom-built stage. This thing is a monster!! Climbing more than 30 feet into the air, this gives us the playground with which to convey the fun and abandon that every CSK fan has come to expect, and rightly deserves!! These people have bought our records and supported the band. These people understand what we're doing, musically. These people have had a rough day at work or school. Whatever the situation, or even if they've never heard a note we've ever played, we're giving them all we got!! When they come to experience a CRASH STREET KIDS show, we're hell-bent on giving 'em one to talk about!!! Graffiti taggers, cheerleaders and Tramps, confetti bombs, money-filled exploding giant balloons...and the kitchen sink!!! Our show has been dubbed, "THE SUPERSONIC STAR SHOW" for a reason!!! When it's all over, the band and crowd are exhausted, and the venue is a MESS! It looks like a hurricane ripped through the arena!! Sweat-smeared, runny make-up is the look of most people leaving our shows!!! And big, big smiles!!! Isn't that what rock and roll is all about?? A.D.: Looks like there are some plans in the works for early this summer. Some U.S. dates on the West Coast, and in the Midwest. We have also been discussing Europe and Scandinavia for later this year. Keep your eyes open! If we're coming through your town, you DO NOT wanna miss this rock and roll extravaganza!! A.D.: We are all on the same page, as far as musical influences. I would fail, miserably, if I were to try to name them all, but here goes: We are all big fans of bands like Mott The Hoople, Ziggy/Aladdin-era Bowie, T. Rex, Slade, Humble Pie, Silverhead, Sensational Alex Harvey Band, Neil Merryweather's Space Rangers, Alice Cooper, Kiss, The Move, Idle Race... and of course the Beatles, Stones, Sabbath, Led Zep, the Who, "Tyranny and Mutation"-era Blue Oyster Cult...good God...the list would just be too long!!! Suffice to say that if it came out in the early 1970's, one (or more) of us has it on vinyl! We have a turntable down at the studio, and we spend many, many hours at a time just LISTENING!!! These sessions are the impetus to our mindset as a group. This is the best stuff, in our minds, EVER!! The fashion, the sounds, the look of the albums and the players in the bands... the whole package is important to us. What we have done is re-packaged that whole ball-of-wax, and taken all of the elements that I mentioned, and made it more modern, while not forgetting to stay true to the "feel" that made these bands so great. More importantly, though, there was a real musical honesty that made them so great, and we feel that this is one of the main elements that has been sorely lacking in the music industry since the end of the mid-1970's. Z! : What is your bands greatest accomplishment? A.D.: Hmmmm.... tough one!!! I guess it depends on how ya look at it. Some people would say that the fact some of us are still ALIVE, would be a major accomplishment!!! (Rimshot!) But, seriously folks....(!) there are a few things that we're pretty proud of. We have received multiple "industry" awards and accolades, and numerous "Record-of-the-Year" honors from organizations and radio stations all over the world. All of the albums have been highly acclaimed by most every critic that bothered to listen. I could go on about that kind of stuff, and although that kind of recognition is very much appreciated, that's not what drives us. To us, it's really all about what the fans think of the latest record, the new video...and all that. That's what makes us feel good- hearing from someone who just bought a CSK record, and digs it enough to take the time to write us and tell us about it!!! Or talking to fans after a show and feeling that mutual high. In other words, when someone REALLY digs what you've put your heart and soul into, that's a major accomplishment to us!!! Z! : What is your most embarrassing on stage moment? A.D.: We were in the middle of "Mandy and the Leapers" (from the "CHEMICAL DOGS" album), a real show-piece! Ryan plays piano on this one, which is on a lift. Just as planned, the guitar solo comes in and the piano starts rising into the air, with smoke machine and strobes in tow. It's a real intense, dramatic part of the show, and all's going well: Ricky's tearing his solo to SHREDS (as usual! ), Deuce and I are holding down the bottom, and Ryan's 30 feet above our heads banging out chords on the ivories and singing his balls off on the last chorus!!! At the end of the chorus, the smoke machine kicks on again and the piano lift starts coming back down, except at about 15 feet above stage level, it suddenly stops!! So there's Ryan stuck up on the lift with no way down!!! Freakin' funny, but hey...what'cha gonna do??!!!!!! That kind of stuff never bothers us...it's gonna happen now and then, and besides, what's more rock and roll than that?!?! We just laughed and kept playing. The cool part was that it all ended up OK, because at the last possible minute, it lowered all the way JUST in time for Ryan to jump off, grab his guitar, and rip out the opening chords to the next song!!! A classic moment! Z! : Is there anything else you'd like to add? A.D.: Sure! First of all, Thanks(!) for the opportunity for us to spread the word about CRASH STREET KIDS! We hope that everyone reading this will take a look, and give a listen to our new record "SWEET CREATURES". It's available at all the usual on-line music sources, and at the better record stores in the U.S. and Europe. You can also stop by and say hello on our social media sites: Facebook, ReverbNation, twitter, and yes, even MySpace, if anybody's still in there!!! 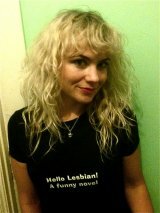 You can also jump on our website- www.crashstreetkids.com - and keep up with all our shenanigans, mayhem, and bobbery!!! You may also wanna check out our "CSK-TV" channel on iTunes...and...jeez, I'm sorry...I started sounding a bit like Gene Simmons there, so I'll just stop now!!! Cheers, Jet Boys and Glitter Gurls!! !